A man was pulled out of the waters near Astoria after he apparently jumped off the Robert F. Kennedy Bridge yesterday morning, according to police. Police received a call around 8:52 a.m. on Feb. 4 of a man, who appeared to be still alive, floating in the East River after possibly having jumped off the bridge. 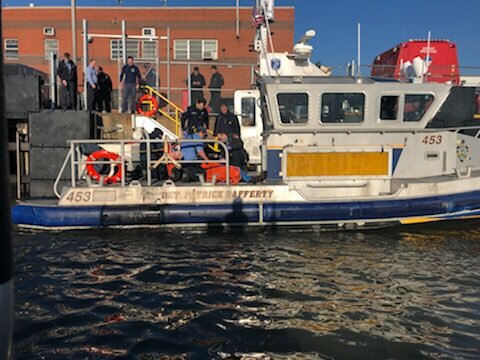 NYPD Special Operations officers got to the scene at around 9:20 a.m., and immediately administered first aid after pulling the man in from the East River. The officers pulled up to a nearby dock, where EMS arrived and took the man to Harlem Hospital for treatment. The man is in critical condition but is expected to recover, according to the NYPD. NYC Ferry personnel also attempted to rescue the man, with video posted to Twitter by Ayana Harry, a news correspondent for PIX 11, showing staffers hurriedly working to bring the man aboard. An NYPD boat, however, can also be seen arriving to the scene to make the rescue.